It is almost time for Halloween and that means time to do the Monster Mash. Not much of a dancer? Don’t worry I’m not either, but I do have this thing for crafts. 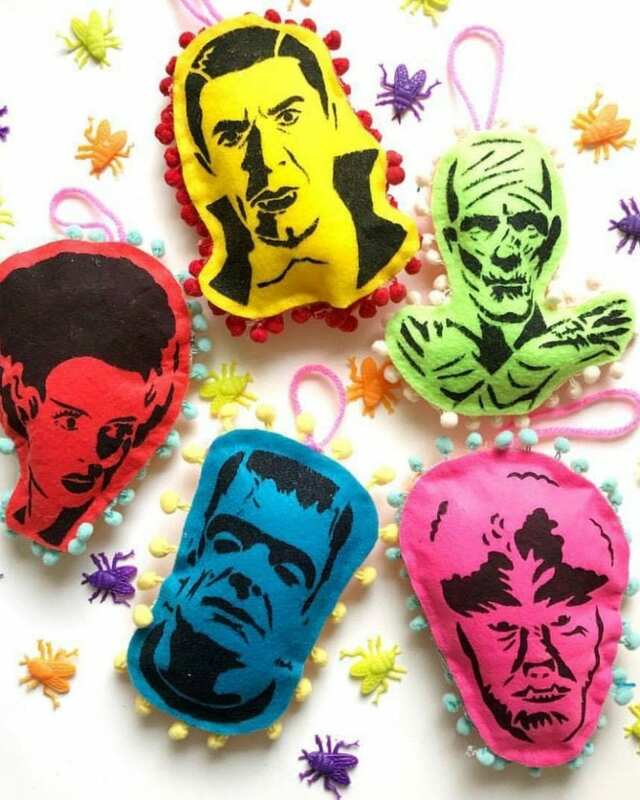 Let’s show our monster love with some fun DIY plush monster Halloween ornaments instead of a dance. 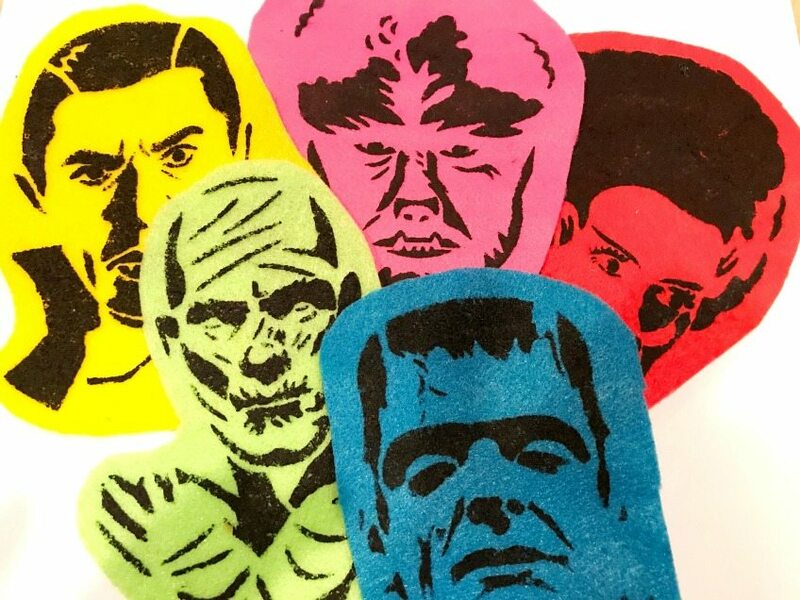 Classic monsters like Dracula, Bride of Frankenstein and The Mummy are all transformed into wee stuffed felt ornies perfect for your Halloween tree. What’s that? 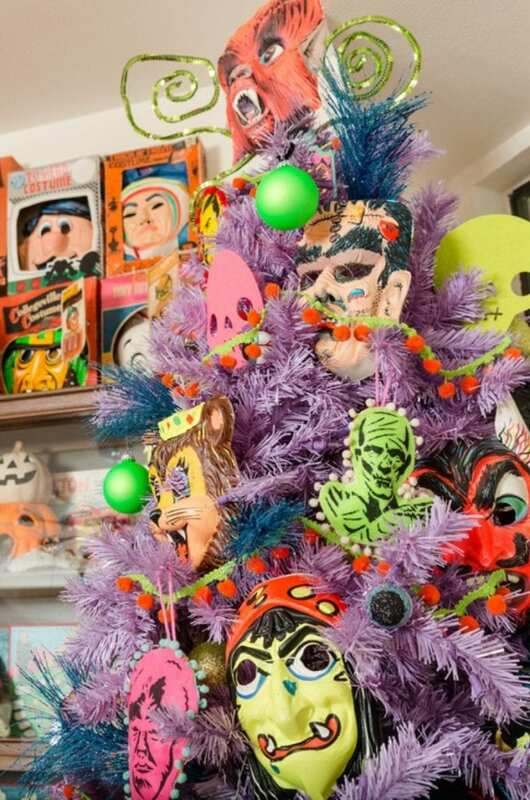 You don’t have a Halloween tree up yet? Well lucky for you it is not too late! 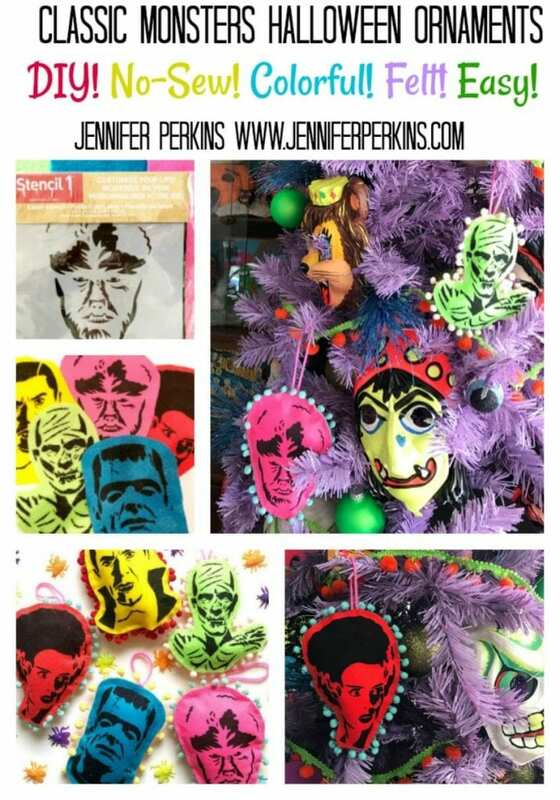 I first shared these DIY Monster Ornaments over on the Treetopia Blog where I also just so happen to be their brand ambassador. Yup that is a sponsored link and I was paid for this post and given a free tree. However, all opinions are my own and it’s not like they paid me to obsess over Halloween I did that way before. Amazing photo by Jennifer M Ramos. 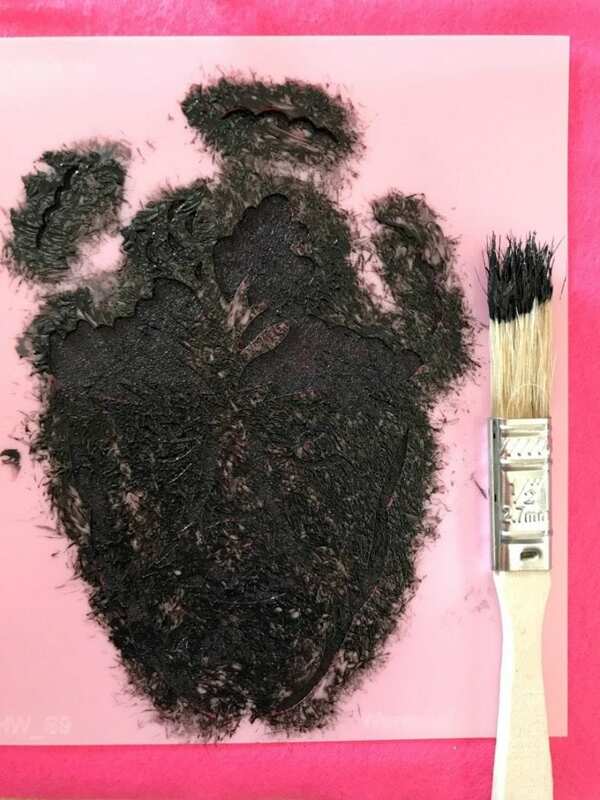 If you want to use brown felt for your werewolf or black and white for your mummy, you do you. I like my Halloween with a wink and a smile so I opted for colorful craft felt. PLUS it’s what I had one hand. 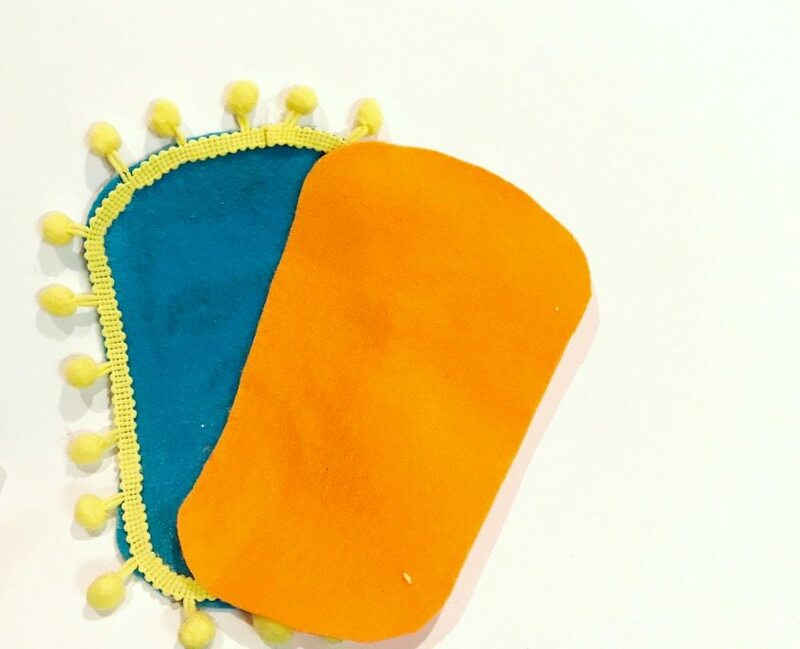 Using a dry brush technique stencil onto your craft felt. What this translates into is the less paint the better. You have a way better chance of messing up your stencil using too much paint. Stencil as many ornaments as you plan on using. Allow paint to dry completely. 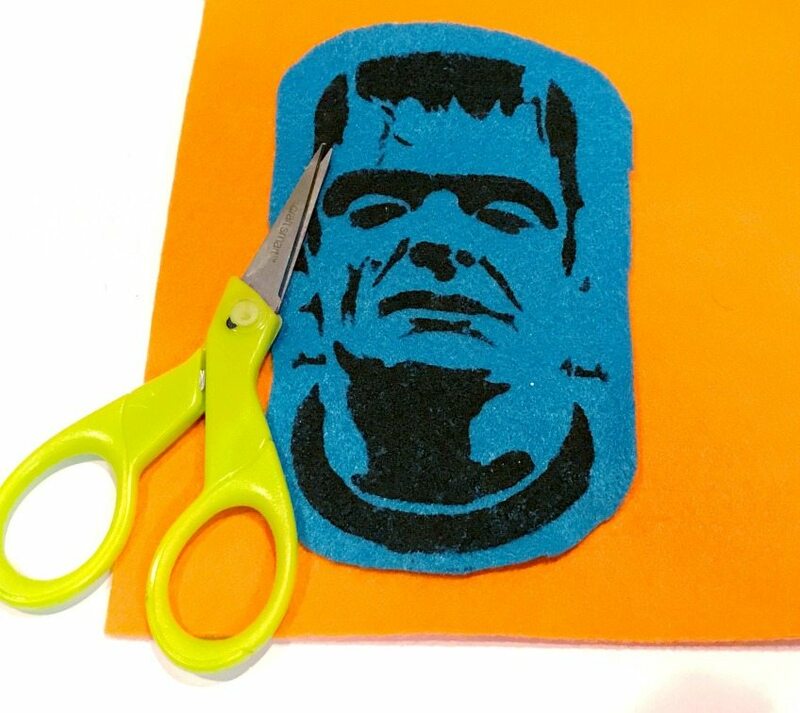 Cut out your felt monsters. Feel free to get precise, I however am not that kind of crafter. Using another shade of craft felt cut out the same size of felt for the back of the ornaments. 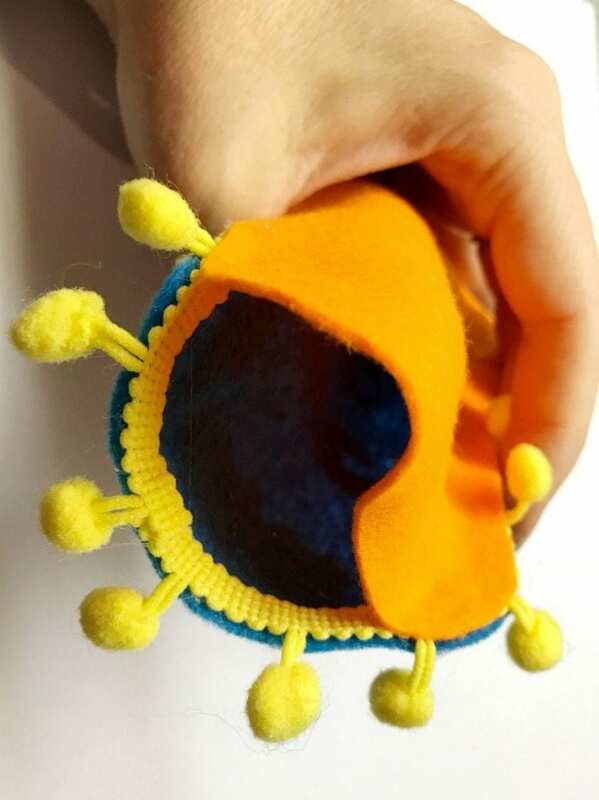 Using hot glue add pompom fringe to one piece of the felt. This step is obviously optional, but for me ball fringe is always a must. If you would prefer to sew these ornaments – more power to you. I instead used my trusty hot glue gun to seal up the felt pouches leaving an opening for stuffing. Fill with just enough batting to make the ornaments puffy, but not overstuffed. Use more hot glue to seal. 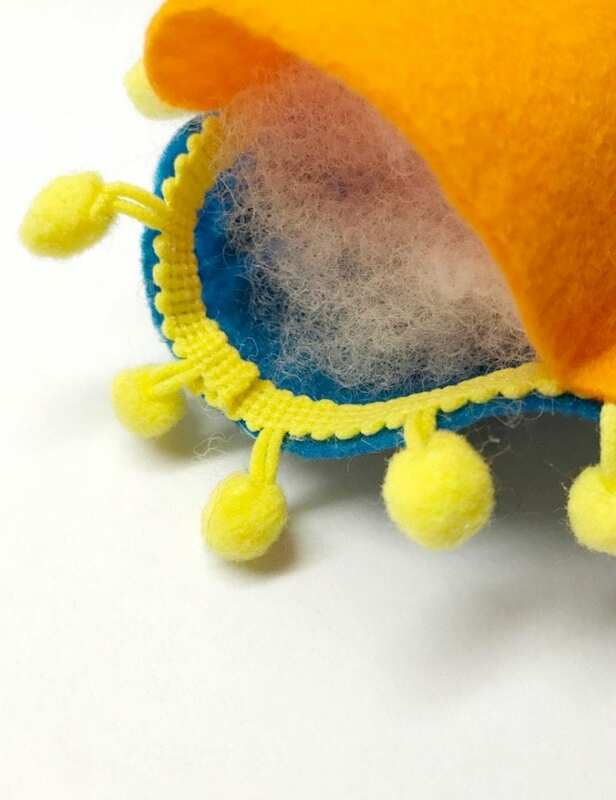 Right before closing the last hole on the tippy top of the monsters head add a small loop of yarn for hanging. 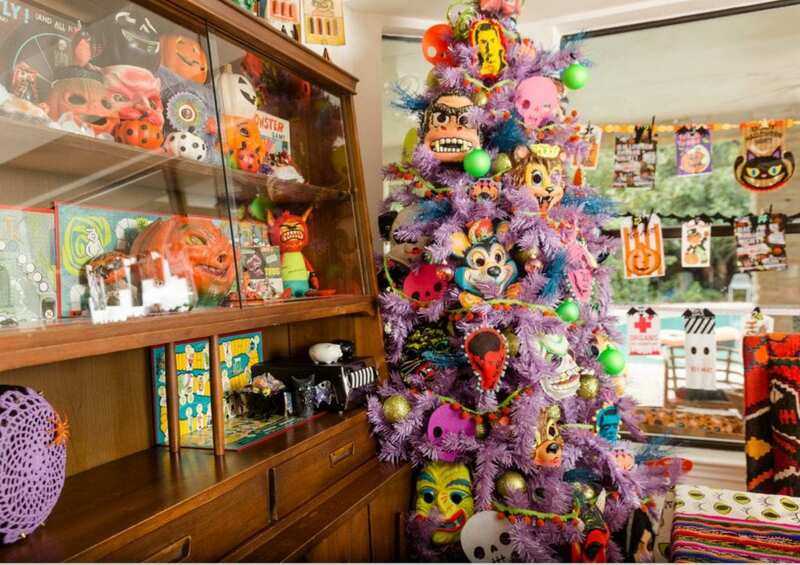 I mean come on – what’s not to love about this Halloween tree. 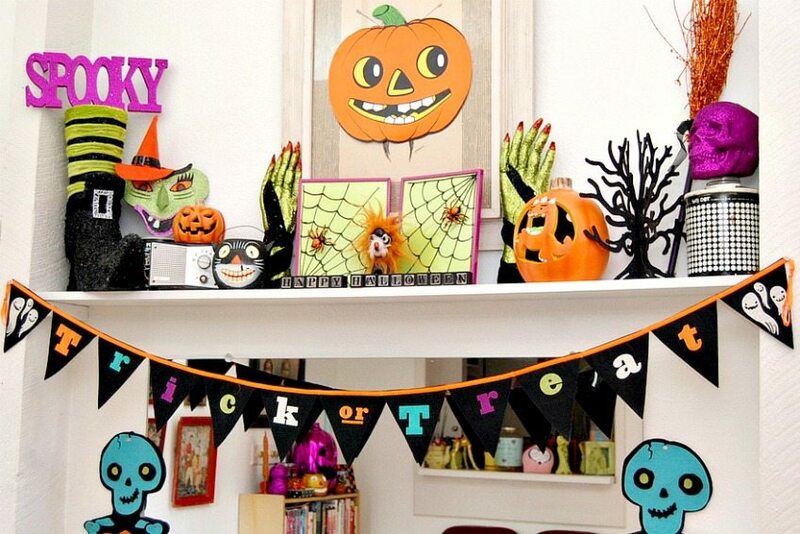 It’s not too scary, it’s colorful and there are craft projects involved. That is my kinda Halloween! Which monster is your favorite? I’m waiting for a Creature from the Black Lagoon stencil. I’m kinda in love with how cute these dudes are! It’s all thanks to the rad stencils from Stencil1. 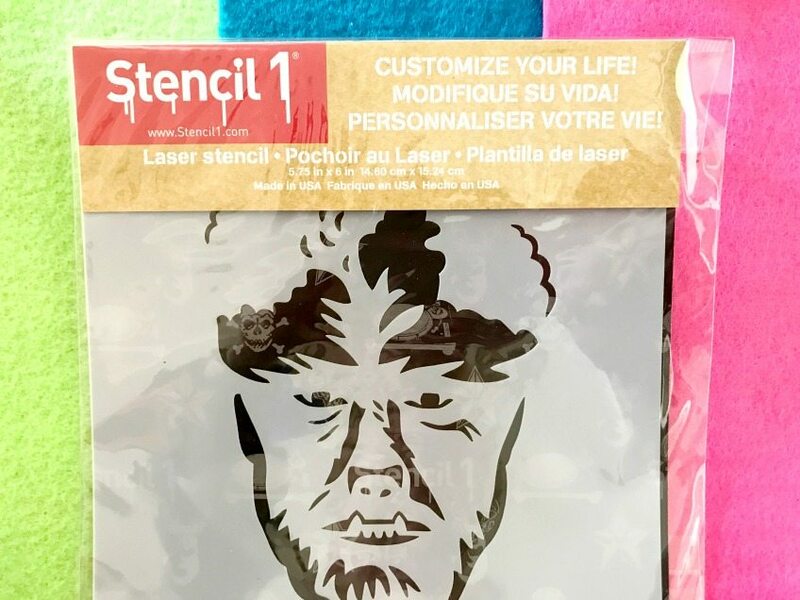 I’ve been using Ed’s stencils for just about as long as he has been making them! Like really his stencils we’re involved in my onesie making baby shower for my first child! I’ve stenciled feathers on dreamcatchers, headphones on bibs, Christmas trees on ornaments, cinderblocks for pool umbrella weights and one time I even used stencils to make my own fabric for a mommy and me skirt! Puffy Paint Spider Web Art – Creating your own festive Halloween display has never been easier when you have a picture frame and Puffy Paint on hand. 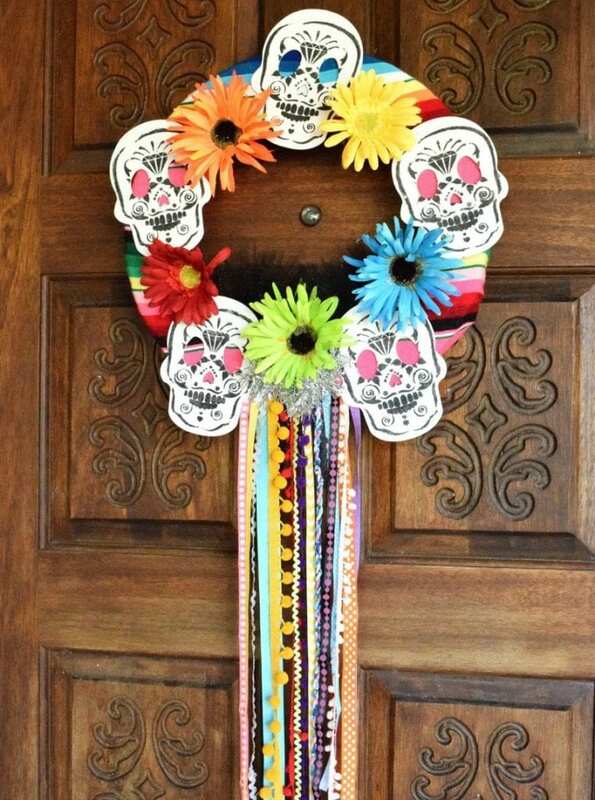 Stenciled Dia de los Muertos Wreath – Once again using stencils from my friends Stencil1 I made this fun Day of the Dead wreath. 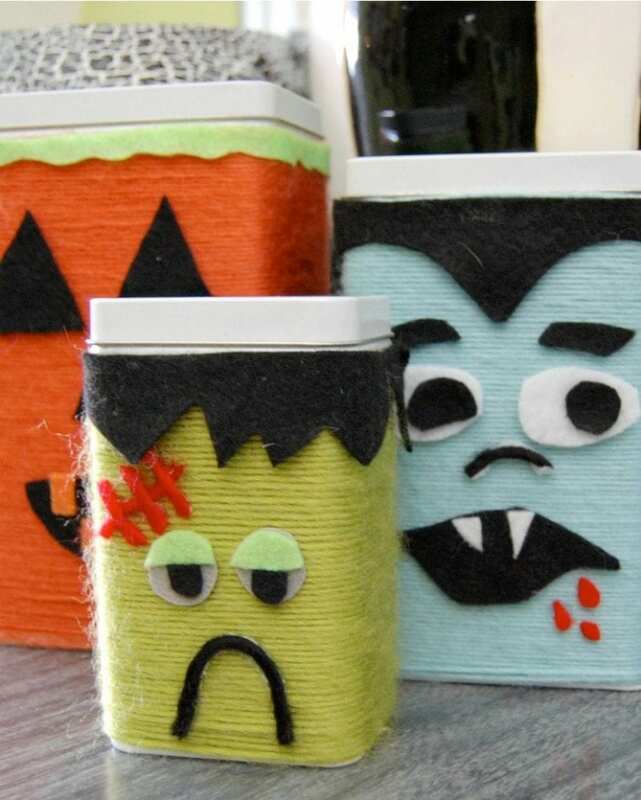 Creepy Yarn Wrapped Monster Canisters – All you need is some felt, yarn and glue to revamp old canisters into something new and improved like Halloween monsters. Posted October 1, 2017 & filed under Halloween, Holidays.